OSAGE CITY—Osage City’s longtime housing manufacturing plant, KanBuild, Inc., laid off most of its employees Friday, citing a reduction of new home orders to a level that will no longer sustain continued operations. Workers were notified during a noon meeting at the plant. Company officials said the suspension of operations effective Feb. 18 was due to a protracted housing recession, tight new home financing and harsher than normal winter weather. 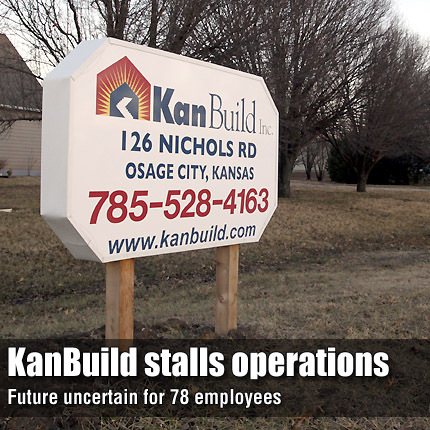 “The company remains hopeful that an influx of orders or a new financial partnership will see the 78 current workers return to their jobs in early spring,” said KanBuild president Quintin Robert. Robert explained Monday that although winter is usually a slow time for the housing industry, the company saw soft sales for a longer period than expected, from November to the present. Robert said that employees were officially notified of the plant shutdown last week, but most have been aware that sales have not been sufficient to keep the plant operating full time. “A good share (of employees) have probably worked two full weeks since Christmas,” Robert said. He said that as the last few orders were being assembled at the plant, employees were called in to work according to their departments. As of this week, only houses owned by the company remained on the property. All completed orders have either been delivered or are being delivered. “We made sure all of our retail customers got their homes,” Robert said. This week, department managers continued to work to maintain and properly store equipment for the shutdown. According to information provided by the company in a press release, the plant in Osage City has operated almost continuously for over 25 years, producing more than 6,000 houses. The plant’s best year, 2001, saw production reach nearly $20 million, with KanBuild’s combined sales level for the year reaching almost $30 million. During its peak operation, the Osage City facility employed approximately 275 people, and in conjunction with its other production facilities, the company employed a total of 500 employees. The company was sold that same year to a publicly traded competitor, Coachmen Industries, which operated the plant under a subsidiary, All American Homes. In the fall of 2005, All American Homes announced its intention to close the facility permanently, and John Samples, now CEO and majority stockholder, led a group of local investors to repurchase the closing facility as he had done in 1989. The company now has two facilities, the manufacturing plant in Osage City and a retail outlet at Lebo. The Lebo outlet will also close as a result of the shutdown. Robert noted that during the most recent economic downturn, the nation has seen housing starts decline at a rate greater than what was seen during the onset of the Great Depression. He pointed to bankruptcies of several of the nation’s top housing manufacturers as a sign of the difficulties faced recently by the housing industry. Robert said that in addition to the lay off of production employees, all managers, administrative personnel, and drafting department employees will see their jobs end within 30 days unless orders increase or investment capital is raised. He said his job would also end in 30 days if orders don’t pick up. “Each week we go into this, more people will be laid off,” Robert said. He said many of the company’s current employees are longtime employees who have weathered the previous shutdowns and owner changes. He estimated 70 percent of the affected employees are Osage County residents, with others from Burlington, Emporia and other surrounding areas. Noting the ongoing recession of the last few years, “We’ve got our employees through two and a half years of it,” he said. He said company staff assisted employees in filing for unemployment benefits after announcement of the closure. Robert said that despite the shutdown, there still exists a chance the company will survive the current financial climate, and company officials continue to investigate possible capital investment options. “We’ve been talking to some investors,” he said. “We’ll know by three weeks – by March 15, we’ll know if we’re going to go or stay,” he said. “Us closing it down doesn’t necessarily mean the end of it. Even if we closed it, I wouldn’t say it wouldn’t open again.” .